In his booklet note for this release, Gordon Getty observes that he has avoided musical settings of the words of living poets apart from himself, “because I prefer to avoid disagreement.” But in the choral works in this collection he has certainly not shied away from competition with other composers who have tackled some of the same very well-known poems: Dowson’s Cynara (so memorably set by Delius), Byron’s The destruction of Sannacherib (by Mussorgsky, no less), and a whole raft of other composers who have engaged with Keats’ La belle dame sans merci – Armstrong Gibbs, Hadley, O’Neill, Scott and Stanford in particular. All the works on this disc were written between the years 2009 and 2015, and therefore postdate the choral music by Getty featured on earlier releases. The title of this collection, however, comes from one of Getty’s own poems, Beauty come dancing, as well as the two opening tracks The old man in the night and The old man in the morning which appear to be autobiographical in inspiration. The first is by a very substantial margin the longest single work on this disc (over a quarter of an hour) and the orchestral accompaniment is vivid even though the xylophone, tubular bells and vibraphone are too prominent in the mix. It seems odd that the quoted voice of the old man is taken by the men of the chorus rather than a soloist, but the contrasts of the poem are nevertheless well reflected in music that responds with sympathy to the dialogue and ruminations of the narrator. All one might wish for is a more substantial melodic profile rather than the Janáçek-like ostinato which underlines some of the word-setting, although the almost Brucknerian climax towards the end is impressive. Similar musical material is featured in The old man in the morning, which is a rather beautiful miniature written four years later. The setting of John Masefield’s Ballet russe has a sense of rhythmic gawkiness which perhaps sits rather oddly with its subject, but then the poem itself, with its juxtaposition of a “Chopin air” with “Roland’s horn”, is peculiar in its own right. The arrangement of Shenandoah also has its unexpected moments, with an orchestral accompaniment that seems to lead an independent existence and which in the third verse provides a really chilly frisson at the words “I love your daughter”. By comparison the setting of Keats’ There was a naughty boy is relatively conventional, with the orchestral accompaniment reduced to sporadic commentary on the rhythmic delivery of the choral text. The setting of Sarah Teasdale’s Those who love the best is beautifully restrained in the opening verse and builds to a thrilling climax in the second, a piece that deserves to be taken up by female choirs around the world. 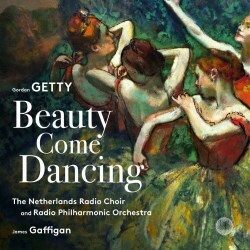 On the other hand, Getty’s setting of his own poem Beauty come dancing seems curiously bitty, an odd choice to headline the title of the disc. The orchestral accompaniment has a nicely sly sense of rhythm, like Prokofiev at his most cheeky, but we need a greater sense of connection between the verses. What is missing is immediately clear in the setting of Edwin Arlington Robinson’s For a dead lady which begins with an attractive oboe melody over harp accompaniment; even the pseudo-Janáçek violin ostinati blend unobtrusively into the setting, despite once again the over-amplified tuned percussion (here an unbelievably loud celesta). The return of the oboe melody at the final words is effective, but one might have welcomed a more conclusive ending. The final three items in this collection consist of the settings of Byron, Dowson, and Keats to which I referred earlier. The Assyrian comes down like the wolf on the fold with all the expected violence that one might anticipate (it follows with rude directness on the quiet ‘fade’ of For a dead lady) and once again the Janáçek-like ostinato figure is prominently on display. Not altogether surprisingly the best passages in the choral setting of Cynara are those which echo Delius’s unforgettable treatment of phrases such as “There fell thy shadow, Cynara!” but then yet again we hear the same “Janáçek” repeated motif in the violins. The wind chords at the words “I have been faithful to thee, Cynara, in my fashion” sound expectedly churchy in this context before the insistent ostinato returns yet again. The ending of the poem, with the woodwind chords, is very sudden; no sense here of the Delian dying fall. The Keats setting is more adventurous, as well as being the second-longest piece in the collection. Sometimes the treatment of the words is undesirably brisk, but then we encounter a particularly memorable phrase – as in the first verse at “And no birds sing” which echoes a passage from Holst’s similarly Keats-based Choral Symphony. The woodwind squawks as the fairy maiden appears are also effective, but then we suddenly find ourselves back in the field of the “Janáçek” violin ostinato which builds to a furious climax at the appearance of the “pale warriors”. The persistent appearance of this ‘motto theme’ is clearly intentional, but its significance eludes me; it serves to bind the three final settings together, but its sheer ubiquity is obtrusive when they are heard in immediate succession as here. The final bars, with the return of the ‘fairy maiden’ woodwind, are however very effective. The recording is generally well balanced even if the chorus is somewhat backwardly positioned in the modern manner; although their diction is clear, we do need the provided texts to keep abreast of what is going on especially in the more heavily-scored passages of The old man in the night and elsewhere. There are some peculiar pronunciations, such as “granary” in the final Keats setting delivered as “grainery”, but nothing to perturb the listener more than briefly. The presentation of this disc, as is usual with Pentatone’s releases of Getty, is impressively lavish: a forty-page illustrated booklet includes the full texts as well as information on the music, albeit in English only. Those who have enjoyed Getty’s earlier discs of choral music will find these settings irresistible. But there are only three items here – the quirky setting of Shenandoah, the lyrical For a dead lady, and the superlative Those who love the best – which rival the earlier Pentatone recording containing Getty’s Young America and Victorian Scenes, which really are something rather special.